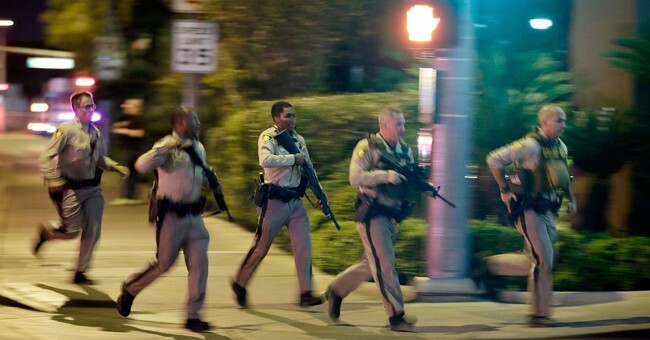 A year ago today, the deadliest mass shooting in American history took place. The Las Vegas massacre was an abomination by any measure you want to use, and the killer’s motives are still uncertain. What we do know, however, is that it sparked a new round of gun control demands. Eventually, they died out as they tend to do, but now that we have reached the anniversary of this tragedy, the discussion is bound to pick up again. Over at the Las Vegas Review-Journal, they featured an op-ed that takes serious issue with the claim that gun control could have stopped this tragedy from happening. It’s natural, of course, to want to do something — anything — to prevent future tragedies. This is when gun control proponents swoop in. They claim minor policy changes will help the government stop shootings. When emotions are high, it’s an appealing pitch — with one problem: It won’t work. Start with the push for universal background checks. Leave aside Question 1, which was so poorly written it can’t be enforced. As a policy, it’s not effective. This isn’t “Minority Report.” Background checks can’t predict future criminals. The Oct. 1 monster passed a background check. Same for the man who killed employees at a Maryland newspaper. An Obama administration push to keep children out of the juvenile justice system allowed the Stoneman Douglas High School killer to legally obtain a weapon. Most firearm purchasers go through background checks already. The only way to buy a weapon now without a background check is from an in-state private-party seller. Do you really think one more law will stop a criminal — by definition a lawbreaker — from buying a gun? The biggest effect of universal background checks will be to inconvenience law-abiding citizens who want to sell their firearms or even let their friends borrow their weapons. And for what? The killers in the most deadly mass school shooting in U.S. history used handguns. Ban semi-automatic rifles, and the calls for handgun bans will soon follow. In London, which has a complete gun ban, police are now confiscating screwdrivers to stop the stabbing epidemic that’s driven the city’s murder rate above that of New York City. Sales of stab-proof clothing have soared in response to the violence. Turns out it’s people who commit crimes, not inanimate objects. It really lays out everything we tend to say, especially in light of the atrocity that was Las Vegas a year ago. Like after so many tragedies, we got a list of “fixes” that would have had no impact at all, even under the most optimistic dreams of those who supported those measures. Like background checks. It’s not new, though. Remember that the Obama administration wanted to bar anyone on the no-fly list from buying guns after the Orlando Pulse shooting. Unfortunately, the killer wasn’t on the no-fly list. The knee-jerk reaction seems to be to demand gun control–any gun control–rather than trying to deal with the real issue. People are the real issue. Not all of them, but a handful of people are so broken that they want to kill as many people as possible. That is the real problem, and unless you deal with that, the best you can hope for is that these broken people will use a different weapon.